Completed one year after the Seattle fire, this five-storey brick building stands on a sandstone and cast iron ground floor. 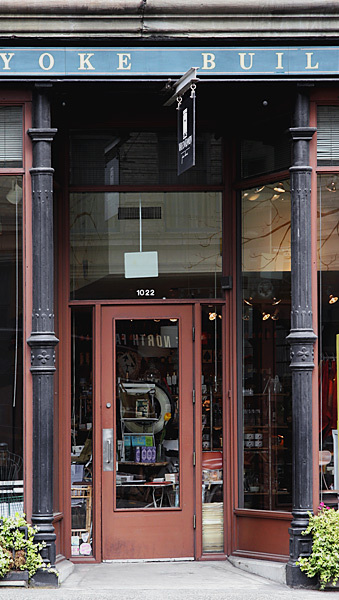 The First Avenue façade has hardly changed and the original commercial storefronts are intact. It's listed in the National Register. This, possibly, late nineteenth century three-storey brick industrial building has been home to the Stonington Gallery for almost thirty years. 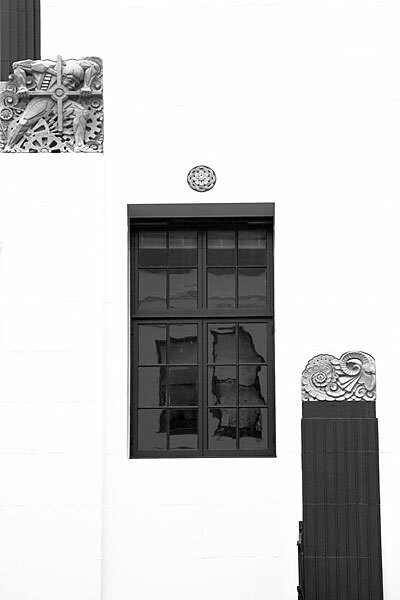 I liked the later and unique relief panels against the white render and the way in which they relate to the entrance door and the window openings. The style of the figurative panels suggests that they, and the stucco, were added to the original brick façade at a much later date. They make this unremarkable building remarkable and a valuable element amongst the oldest architecture in downtown. On a granite base, this six-storey building incorporates sandstone, brick, and terra cotta, with projecting cast iron windows and cornice. 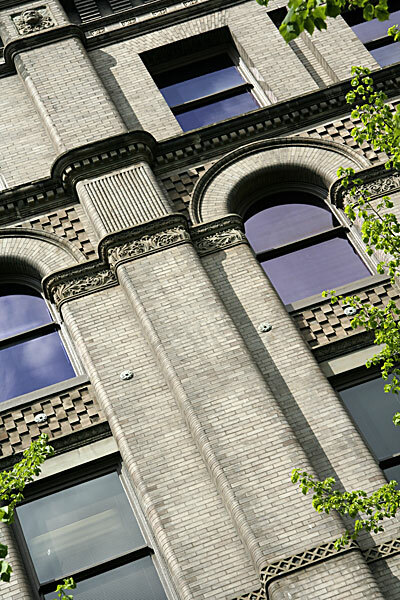 In Romanesque Revival style, a rich mix of material textures and relief motifs enliven the facades. It is a designated National Historic Landmark. The rusticated stonework, triple arched window and the clustered columns frame this corner entrance. 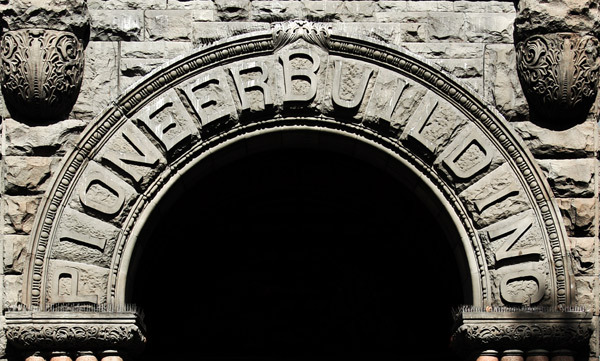 For a short time Elmer Fisher was a leading Seattle commercial architect, working in Romanesque and Classical Revival forms. The sunlight of a late September afternoon cast the entrance lobby into cavernous shade and emphasised the letters cut into the heavy masonry. 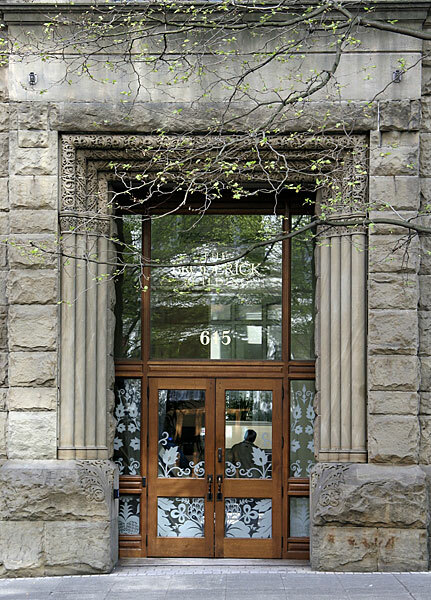 Built for the Dexter Horton Bank, the design in grey pressed brick and sandstone shows influences from the contemporary Romanesque Revival Chicago style. 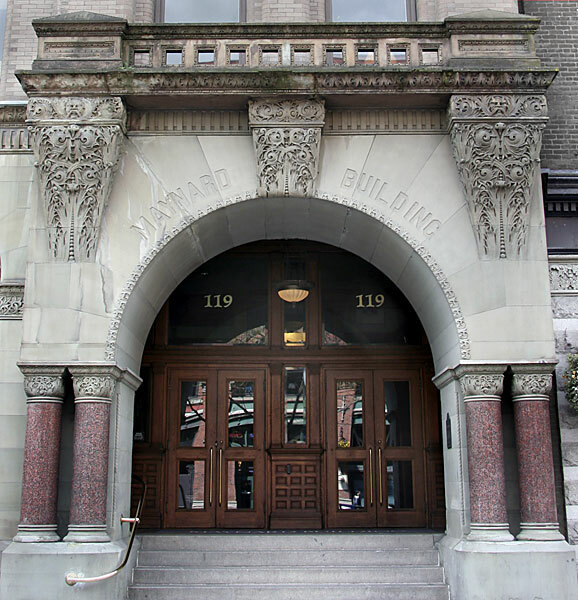 This imposing entrance is placed on the right of the asymmetric First Avenue South façade. This perspective of the upper three of the 6 floors on the side of the building include some of the design forms and details typical of the whole. The colour and finish of the pressed brick works well with the carved stone: the build quality is extremely high. 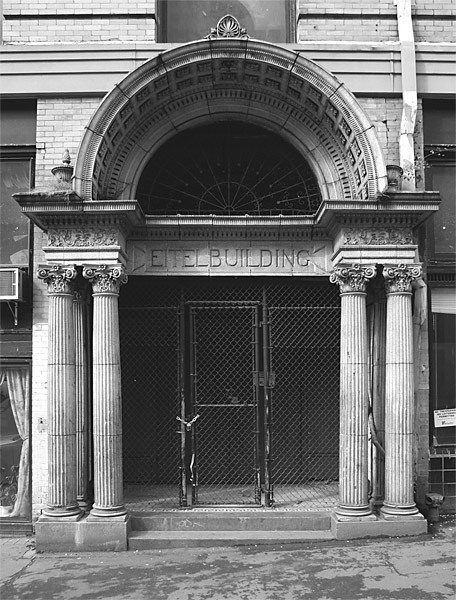 This is the Second Avenue entrance to the Broderick Building. This finely detailed stonework, with its stylised plant relief carvings, is in marked contrast to the boldly rusticated masonry of the main structure. 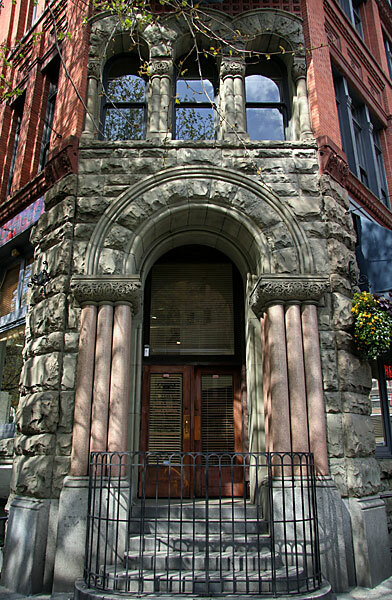 After the 1889 Seattle fire, stone was less commonly used as a primary material. 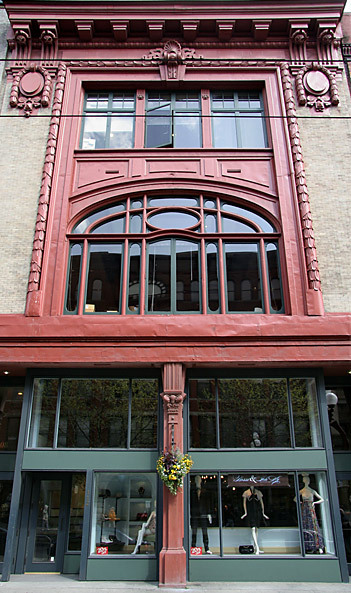 This steel-framed building on Second and Pike dates from 1904. Currently empty and in an uninviting streetscape it has been awarded City Landmark status and will be renovated as part of an area redevelopment. 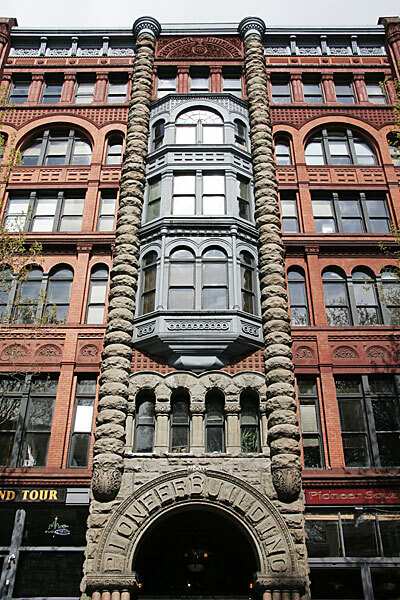 Named for Seattle businessman James Colman, this six-storey design in the Chicago Style replaced a two-storey Romanesque building completed by Stephen Meany in 1889 to house Klondyke mining related businesses. It is listed in the National Register. This three-storey buff brick building has Art Nouveau, Beaux Arts and Classical references. The upper floors are dominated by the original ornamental window framing and cornice formed in painted metal and cast stone. Opened as one of Seattle's first motion picture theatres, the Coliseum was renovated in 1995 and now houses a Banana Republic store. 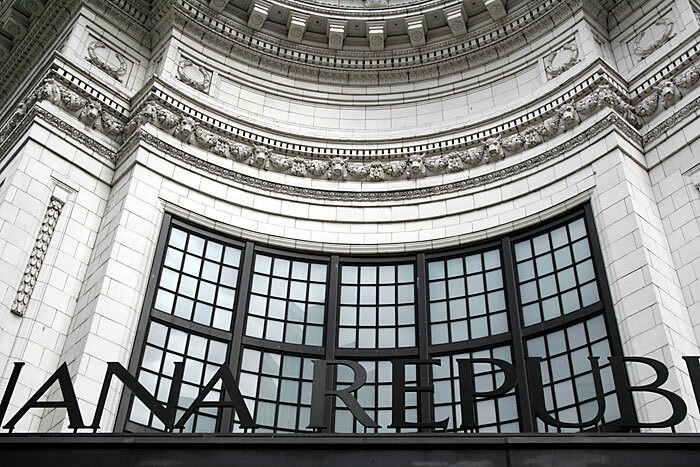 Although changes have been made in the past, much of the original Renaissance Revival terra-cotta façades are intact. 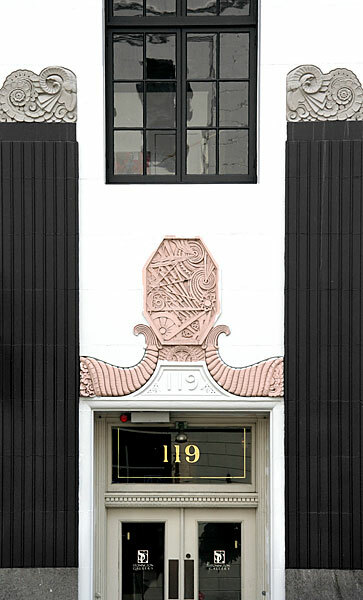 This very fine 27-storey Art Deco tower was built for the Northern Life Insurance Company. The strong vertical forms incorporate decorative panels set against plain brick, with bronze detailing to window frames and door cases. 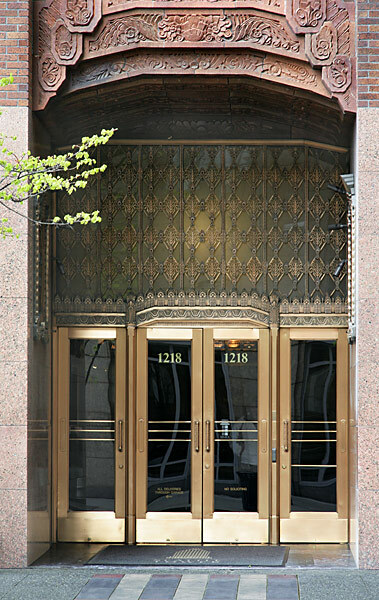 This is the principal Third Avenue entrance opening into a richly detailed lobby incorporating bronze, marble and gilt and with a spectacular clock on the rear wall. Built originally as a ticket office for the Great Northern Railroad, this pale grey limestone-faced building has four floors. 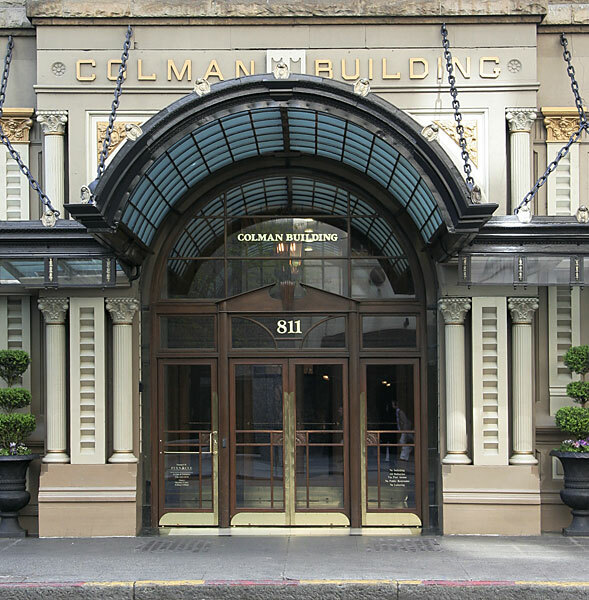 Its severely simple flat facades are enhanced by classical details, as well as bronze relief window framing and incised stone panels in Art Deco style. 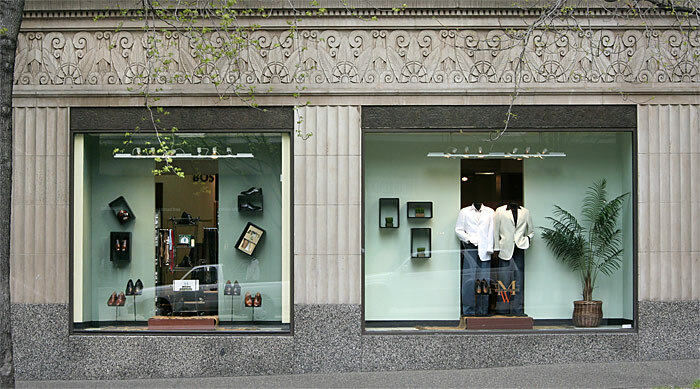 Classical detailing and Art Deco stylised foliage enhance the display windows. 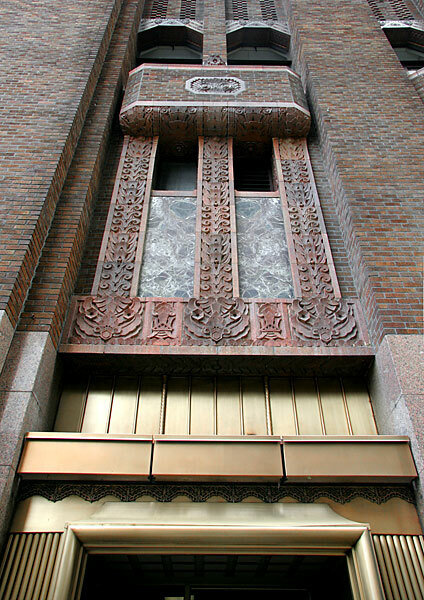 Upper floors have slender wooden glazing bars carved as skyscraper forms while Native American feathered headdress and flower motifs are carved into the pediment. 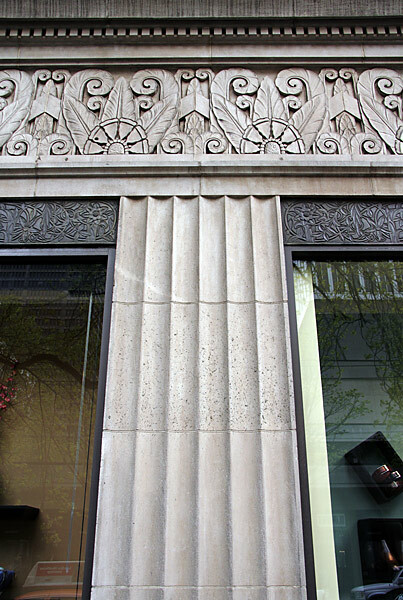 The Ford Pacific Building, and the adjoining Ford McKay Building, was built for one of the early Ford-Lincoln dealerships in Seattle. Currently empty, both retain much of their original structure, including the ornate terracotta exterior cladding, and are to be restored.